Altamaha pottery, also known as San Marcos pottery, appears in the archaeological record from St. Augustine, Florida northward to Glen County, Georgia along the Atlantic coast and inland along the Altamaha River as far west as the Big Bend area where the Altamaha becomes the Ocmulgee River. It’s distribution follows the establishment of the Spanish mission system in north Florida west to Tallahassee and along the Georgia Atlantic coast and up the Altamaha River. The pottery was tempered in Florida with sand, but in the immediate area of St. Augustine, Florida the Indians used limestone in their paste. The people of Georgia used grit as they did in so much of their pottery over the centuries. 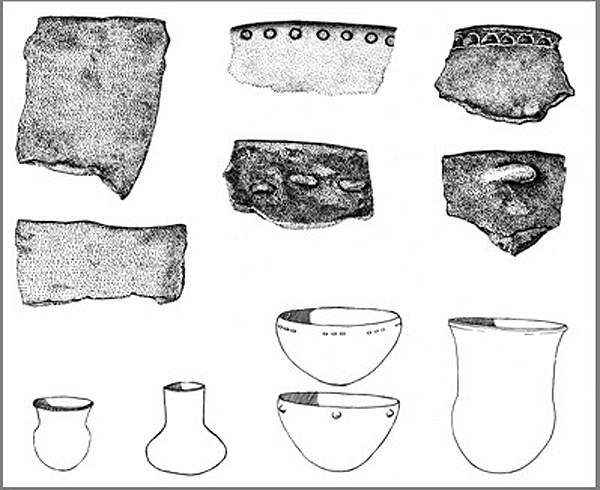 Altamaha pottery was decorated with stamping that was often either of a curvilinear or block stamp pattern. Simple and check stamping was also used, but many vessels were either left plain, brushed or painted with a red slip or wash over the entire surface. Early archaeologists like John Goggin and Smith gave an early date of 1686 for simple stamped designs with other designs being even earlier. Averett pottery was made by the Indians living along the central Chattahoochee River in both Alabama and Georgia. The pattern of distribution probably stretches from the Alabama River in Alabama to the Flint River in Georgia. This was a grit-tempered pottery that dates between 650 and 850 A.D. 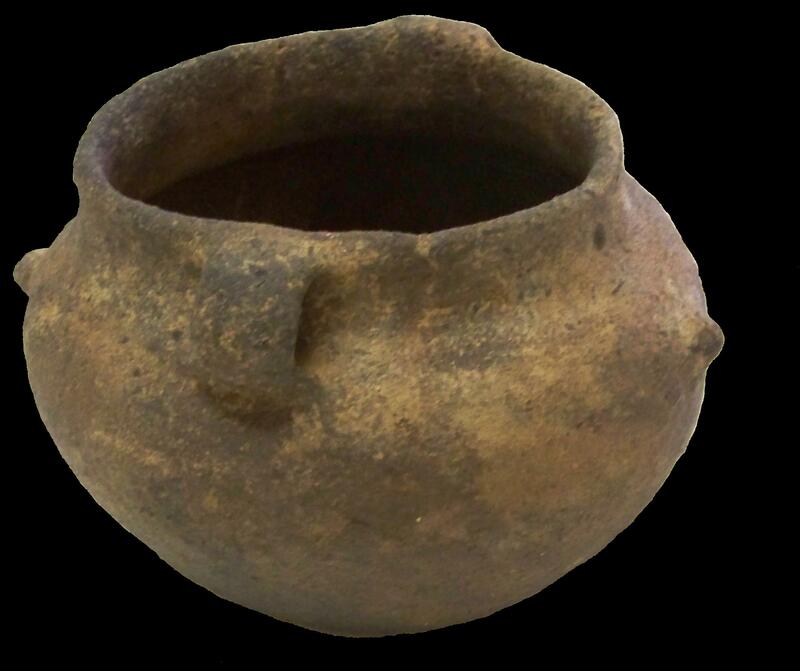 Vessels are usually globular or semi-conical jars with rims that flair outward. Decoration on these vessels consisted of brushing over the entire surface or incised lines along the shoulders. Some vessels were left plain. RESEARCH: Jennings and Fairbanks reported on this type in 1940. The type was defined in the 1930s as part of the massive WPA excavations at the mound complex that is now the Ocmulgee National Monument in Macon, Georgia. TEMPER: This is plain pottery on an orange paste that is tempered with a mixture of sand, grit and shell. Crushed limestone and quartz may also be abundant to moderate in the mixture. The texture is rough and crude and frequently has white dolomite inclusions in it. The external color is red-brown to dark chocolate. SURFACE DECORATION: This is a plain pottery with an orange paste due to the hematite in Georgia’s red clay. A few vessels were also were made of kaolin and are very light tan in color. The surface is smoothed but not burnished and is usually eroded to show some core. 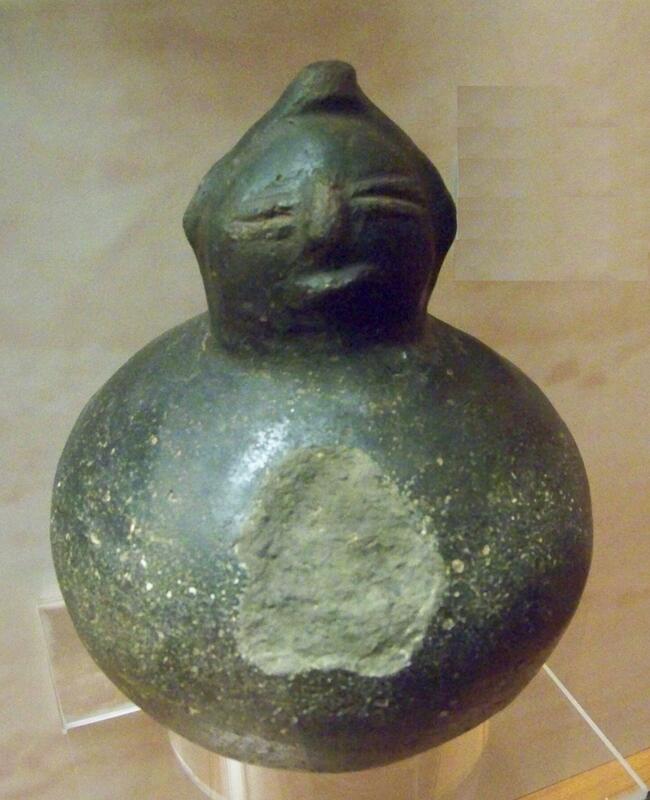 VESSEL FORM: Vessel forms include globular jars similar to gourds with slight shoulders. Rims are slightly flaring, straight, or surged. Lips are rounded, flattened, rarely squared, narrowed and rounded, or slightly extruded. This is the most common of the Macon Plateau pottery types. Appendages include loop handles with bifurcated lugs between handles. 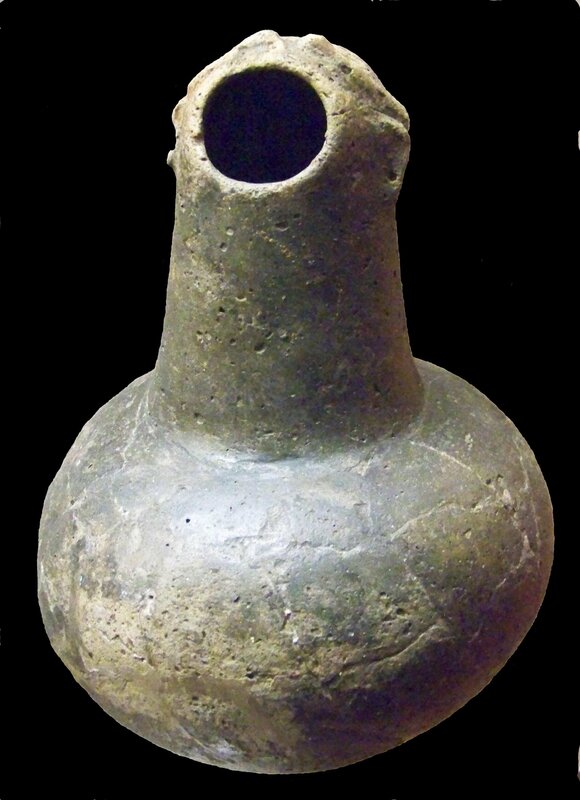 CHRONOLOGY: This is an Early Mississippian pottery type that belongs to the Macon Plateau period. Associated points might include Mississippian Triangular points. 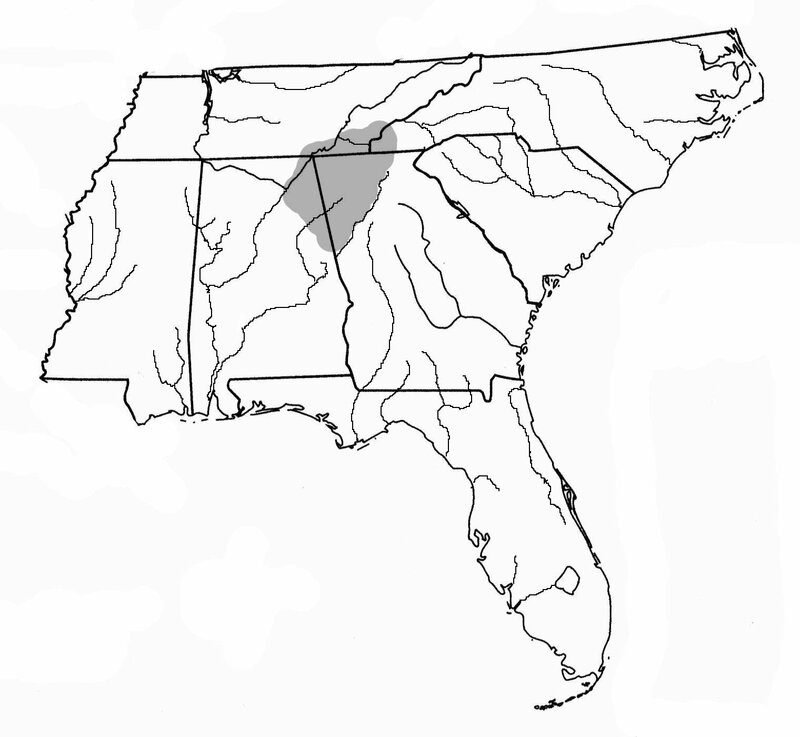 GEOGRAPHIC DISTRIBUTION: Bibb Plain pottery is found almost exclusively within a ten mile radius of the city of Macon, Georgia. RESEARCH: In the mid 1950’s, Charles Fairbanks gave this name to otherwise Bibb Plain pottery at the Brown’s Mount site east of Macon Georgia. 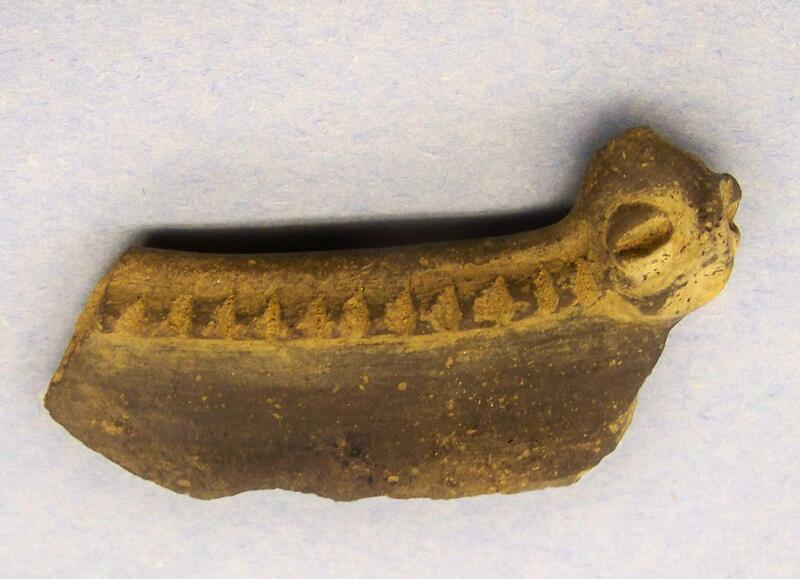 The excavation had produced Bibb Plain bowls with small owl effigies perched along the lips of the bowls. 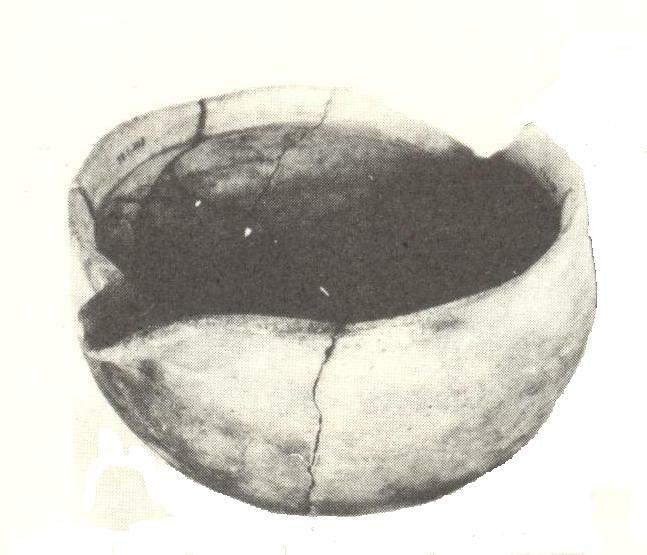 These bowls were recovered in sufficient numbers during the excavations of the 1930’s that Fairbanks thought it worthy of a separate designation. TEMPER: This is plain pottery tempered with grit, shell, or mixed shell and grit on an orange paste that is sand tempered. The texture is rough and crude and frequently has white dolomite inclusions in it. SURFACE DECORATION: This pottery is the same as Bibb Plain except that the vessels have a notched appliqué strip with small owl effigies placed along the rim. VESSEL FORM: Vessels are hemispherical bowls. Rims are straight or slightly curved. Lips are usually rounded, narrowed and rounded, and rarely square. 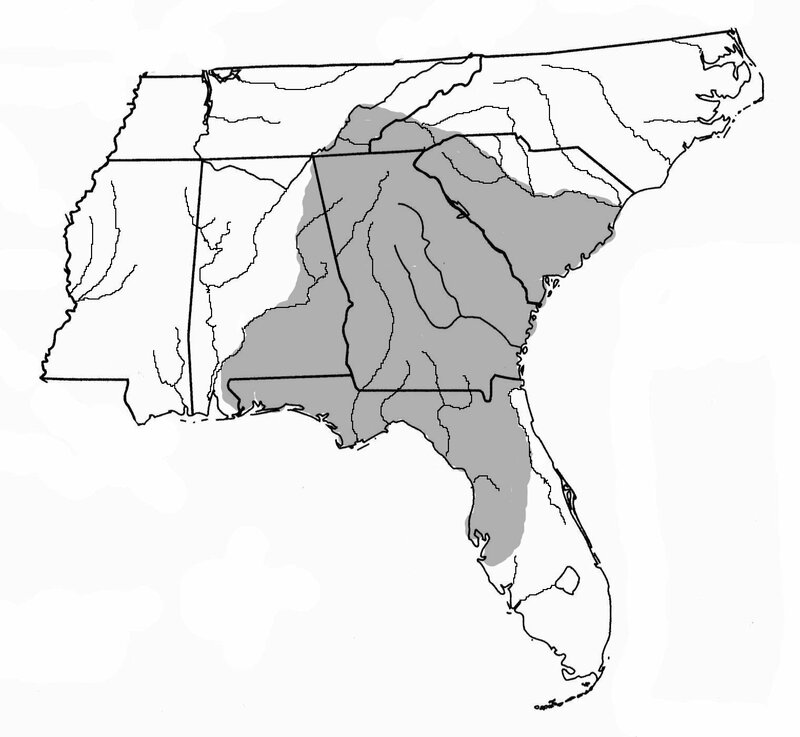 CHRONOLOGY: This type, like Bibb Plain, is related to the Early Mississippian, Macon Plateau period. Associated point types would include Mississippian Triangular and Guntersville points. GEOGRAPHIC DISTRIBUTION: The specific vessels to which Fairbanks applied this name were recovered exclusively from the Brown’s Mound site. RESEARCH: Bennie Keel defined this defined this as an annular or segmented coil pottery that was built on a conical, disc, or tabular base. Keel’s description of this type was based on his research in sites in western North Carolina. TEMPER: Connestee Plain pottery was tempered with fine to medium sand with small amounts of crushed quartz occasionally mixed in. The sand often contained mica naturally, but it was not purposefully mixed in. The surface was smooth, but sandy to the touch with a light tan to dark brown exterior, with darker colors being more predominant. SURFACE DECORATION: The surface is well smoothed, but not polished or burnished. Some incised, plain neck bands (right) may belong to this type. 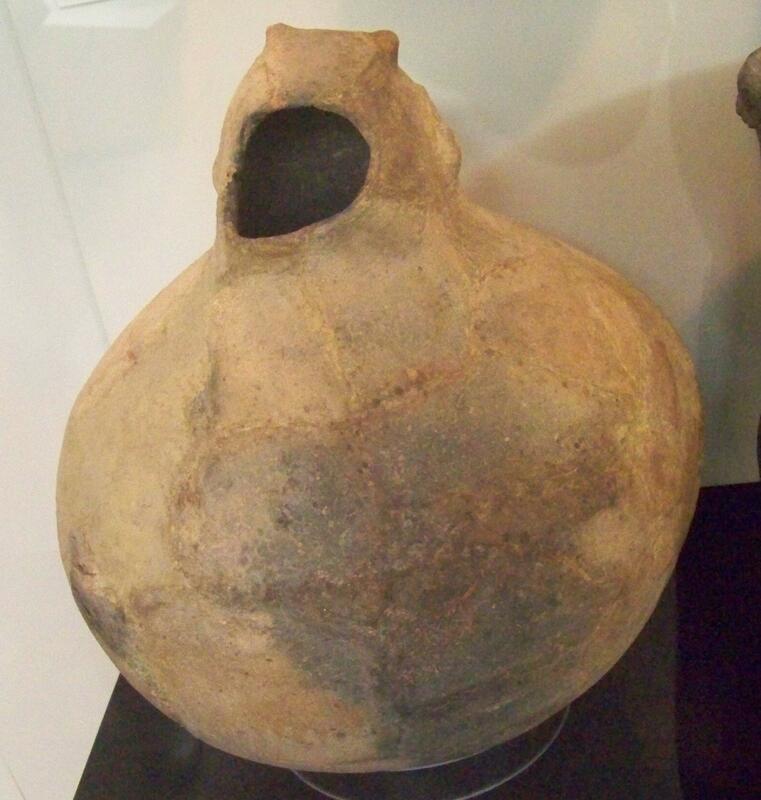 VESSEL FORM: Vessel forms included conoidal jars, hemispherical bowls and flat-based jars with podal supports. Lips were rounded, flattened or chamfered. These were notched, brushed or punctated. Rims were most often flaring, but were also straight, vertical or incurved. 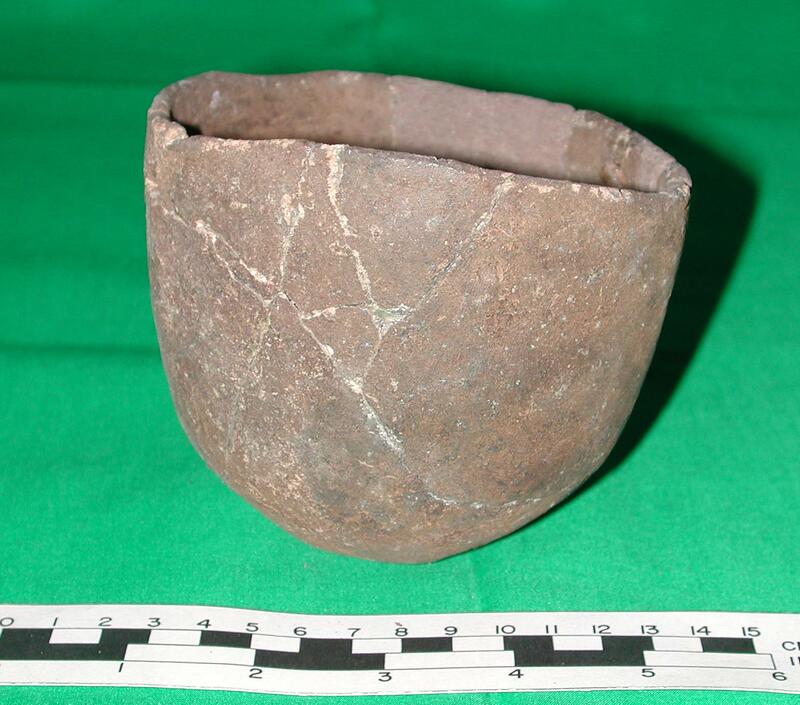 CHRONOLOGY: A number of radiocarbon dates from various sites have been associated with Connestee pottery that range from Middle to Late Woodland periods. From Russell Cave, Alabama, the type dated to A.D. 740+/- 100. In Tennessee the type dated to A.D. 605+/-90 at Icehouse Bottom. In Georgia at Tunacunnhee it dated to A.D. 150; at Manderville to A.D. 530+/-150. In North Carolina at the Garden Creek Mound No.2 site it dated to A.D. 805+/-85. Keel concluded that Connestee pottery disappeared between A.D 600 to 650. GEOGRAPHICAL DISTRIBUTION: Connestee pottery has been found in western North Carolina, western South Carolina, eastern Tennessee, and northwestern Georgia, and northeastern Alabama. RESEARCH: Tomas M.N. Lewis and Madeline Kneberg named the Dallas pottery types in 1946. Lewis and Kneberg did their research on Hiwassee Island, Tennessee. This type was named for the old town of Dallas, Tennessee, now at the bottom of Chickamauga Lake. TEMPER: Fine to medium particles of crushed shell was used as temper in this type. Paste color ranges from light to dark gray, light and dark brown, and brick red. SURFACE DECORATION: The surface of the vessel is void of any decoration. VESSEL FORMS: Known vessel forms include shallow open bowls and small globular jars, some of which have strap handles or suspension holes. CHRONOLOGY: Dallas pottery belongs to the Late Mississippi period associated with Dallas and Mouse Creek phases in Tennessee and the Barnett phase in northwestern Georgia. Associated point types might include Mississippian Triangular and Guntersville points. GEOGRAPHIC DISTRIBUTION: Dallas pottery is found in eastern Tennessee, northwestern Georgia, western South Carolina and northeastern Alabama. TEMPER: Fine Sand was used for tempering. SURFACE DECORATION: The surface is without decoration. VESSEL FORMS: Vessels are usually pots with sub-conoidal or truncated conical base. Rims are simple, unmodified and slightly out-curving. Bases are much thicker than the upper walls. Many basal structures include podal supports. CHRONOLOGY: Deptford pottery is part of the Middle Woodland period. Associated points might include spike forms, Woodland Triangular, Baker’s Creek, Yadkin, Copena, Camp Creek, Greenville, and Swan Lake points. 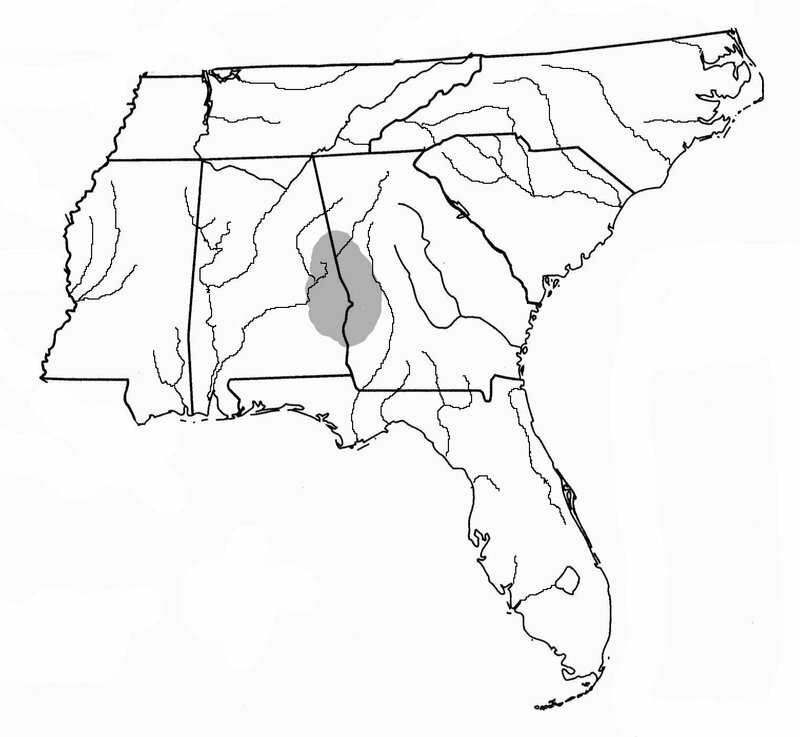 GEOGRAPHIC DISTRIBUTION: Deptford pottery is found over a wide range from the South Carolina coast across Georgia and parts of eastern Tennessee and eastern Alabama and northern Florida as far south as the Tampa Bay area. North of Georgia’s Fall Line it is known as Cartersville Check Stamped, but the pottery is the same as Deptford pottery. RESEARCH: This type was defined by William Sears in 1958. 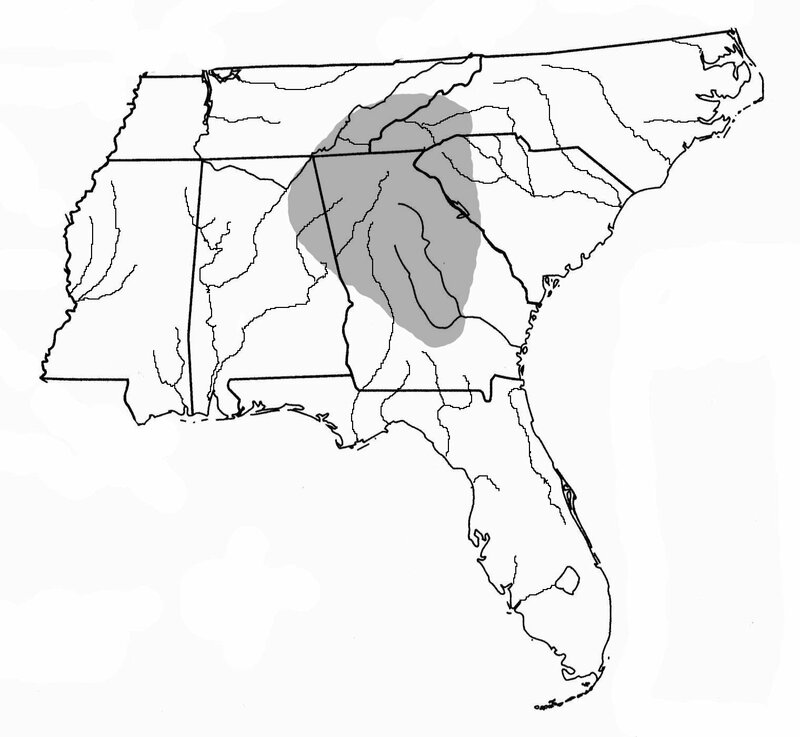 [i] The type is known from the Etowah Mound complex located on the Etowah River in northwestern Georgia, but was spread over most of Georgia and surrounding areas by the Etowah people. TEMPER: This is a grit-tempered pottery type. SURFACE DECORATION: The surface of this type is finely burnished. Some bowl forms have an appliqué strip that is notched or the addition of human faces. 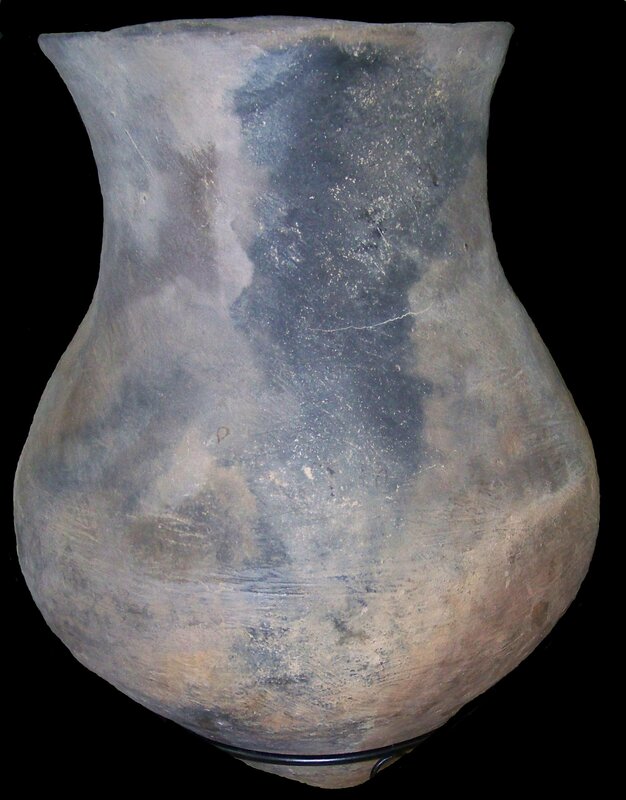 VESSEL FORMS: Known Etowah vessel forms include wide-mouth conoidal jars, globular jars, bowls, and cylindrical vases. Rims were flared, vertical, out-curved, or in-sloping. CHRONOLOGY: The Etowah type belongs to the Middle Mississippian, Etowah period. 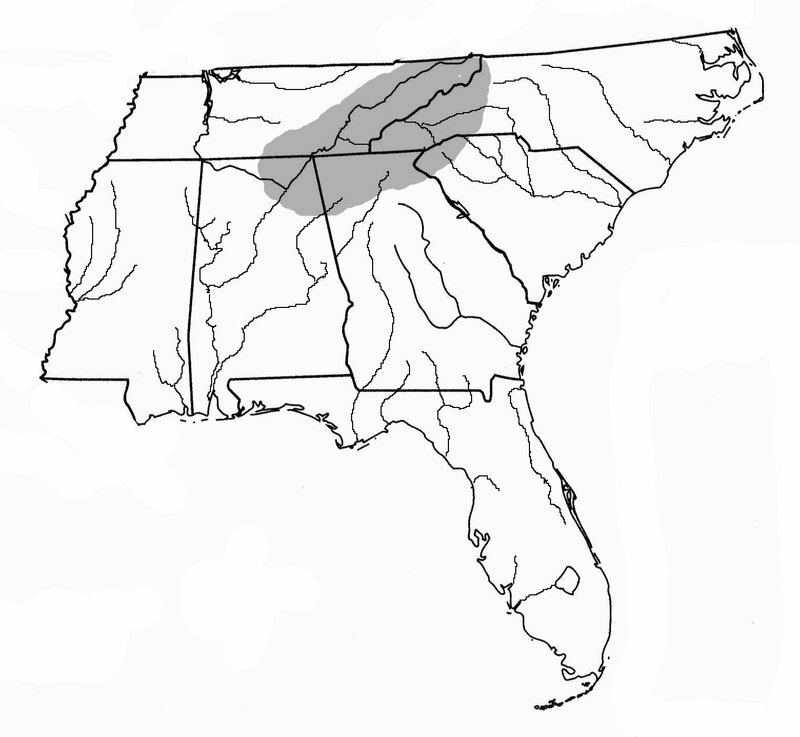 GEOGRAPHIC DISTRIBUTION: This type originated at the Etowah site in northwestern Georgia but was spread in small quantities by the Etowah people throughout Georgia, Alabama, Tennessee and probably western North and South Carolina. RESEARCH: This type was named after the Etowah site by Robert Wauchope in 1948. 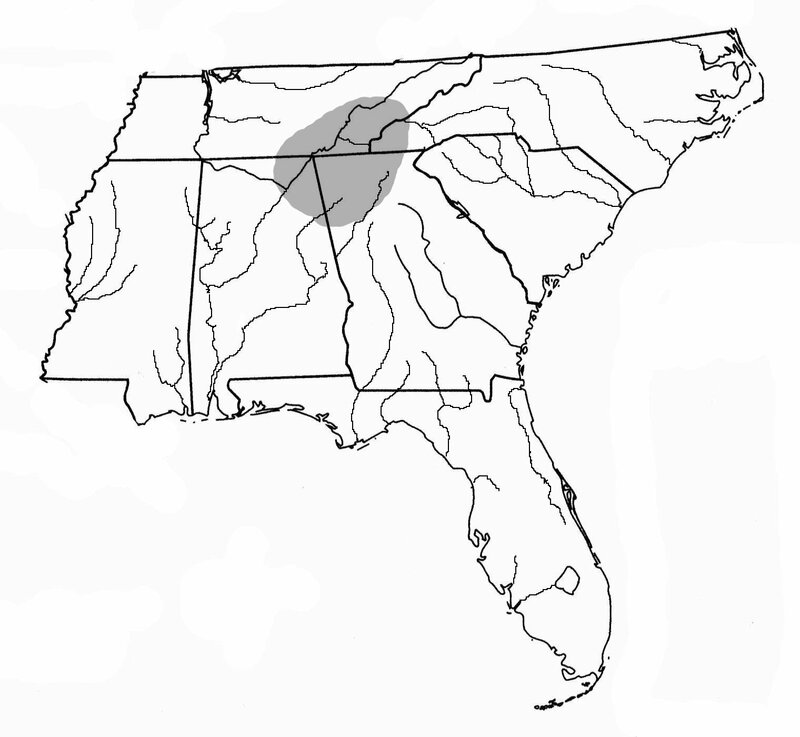 The type is known from the Etowah Mound complex located on the Etowah River in northwestern Georgia, but was spread over most of Georgia and surrounding areas by the Etowah people. SURFACE DECORATION: This is plain pottery associated with other known and recognizable Etowah pottery types and stamps in Middle Mississippian period sites. CHRONOLOGY: The Etowah type belongs to the Middle Mississippian, Etowah period. Associated point types might include Mississippian Triangular and Guntersville points. RESEARCH: This type was named after the Etowah site by Robert Wauchope in 1948. 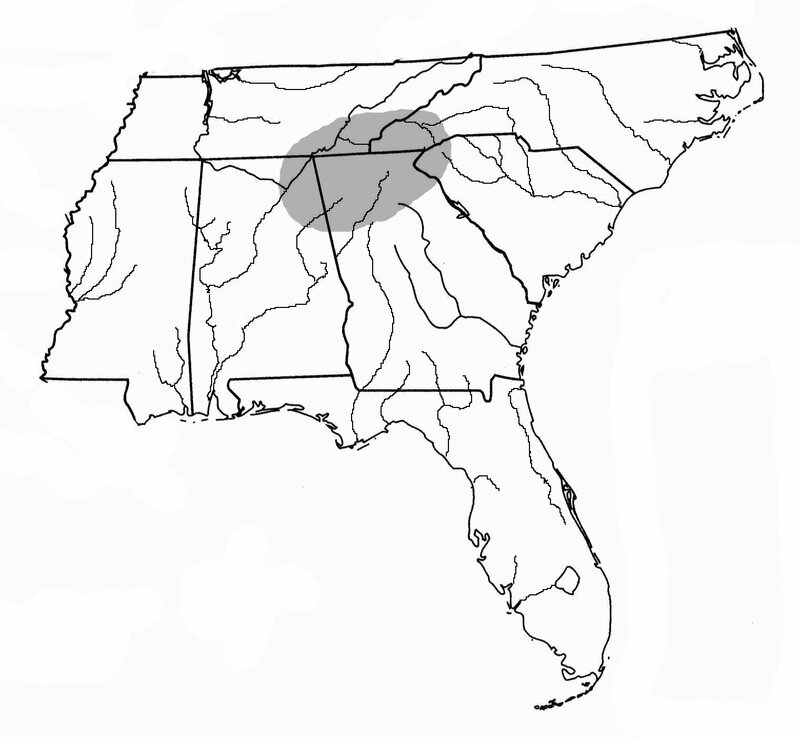 This type is known from the Etowah Mound complex located on the Etowah River in northwestern Georgia, but was spread over most of Georgia and surrounding areas by the Etowah people. SURFACE DECORATION: This is smoothed, plain pottery associated with other known and recognizable Etowah pottery types and stamps in Middle Mississippian period sites. TEMPER: This is a grit-tempered pottery type. The paste color ranges from gray to black rather than tan or brown. SURFACE DECORATION: The surface of this type is plain, but would be on a paste that is gray to black in color and that may also have a bluish tint. VESSEL FORMS: Known vessel forms include at least a cylindrical jar with expanding rim and rounded lips and flat, round bottoms. 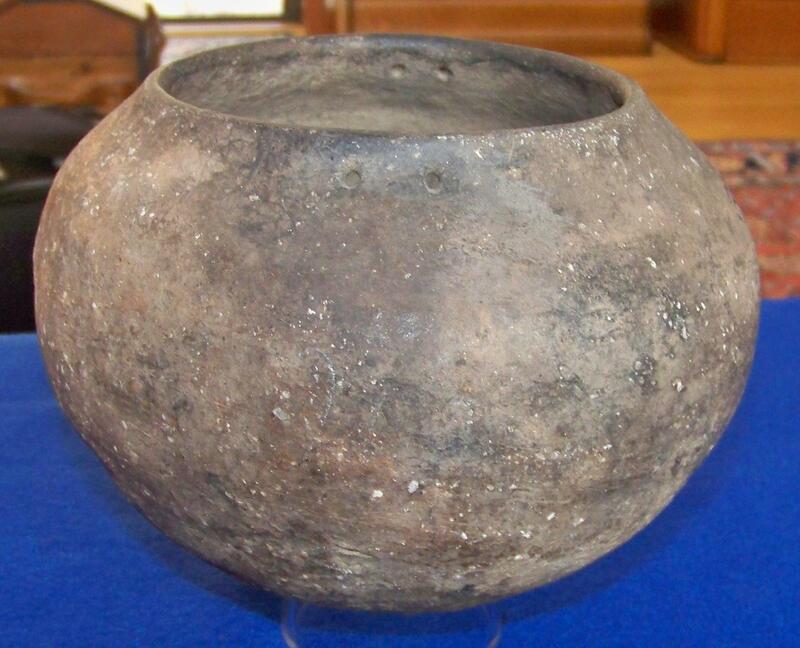 CHRONOLOGY: This is a historic Cherokee pottery type dating between the 1700 and 1800's. This type might be found with brass Kaskaskia points. 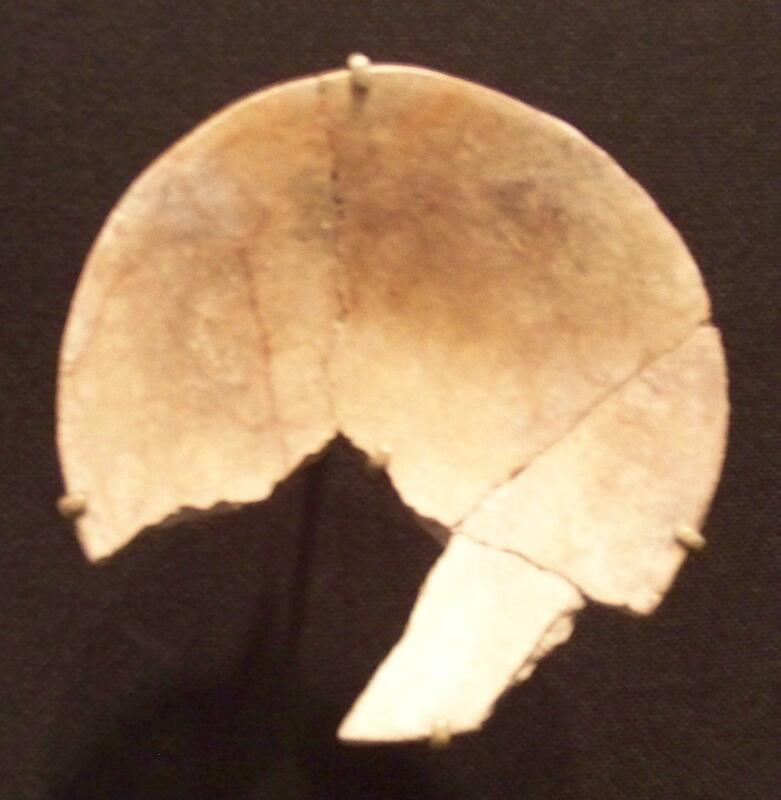 GEOGRAPHIC DISTRIBUTION: This type might be recovered from any of the Cherokee sites dating after 1700 in northwestern Georgia, western South Carolina, southeastern Tennessee and northeastern Alabama. RESEARCH: Jesse Jennings and Charles Fairbanks named this type from the early 1930’s excavations of a trading post in the area of the Ocmulgee National Monument. TEMPER: Halstead is tempered with finely ground shell. The color is often black to gray. SURFACE DECORATION: This is high quality plain pottery from the Macon Plateau site. 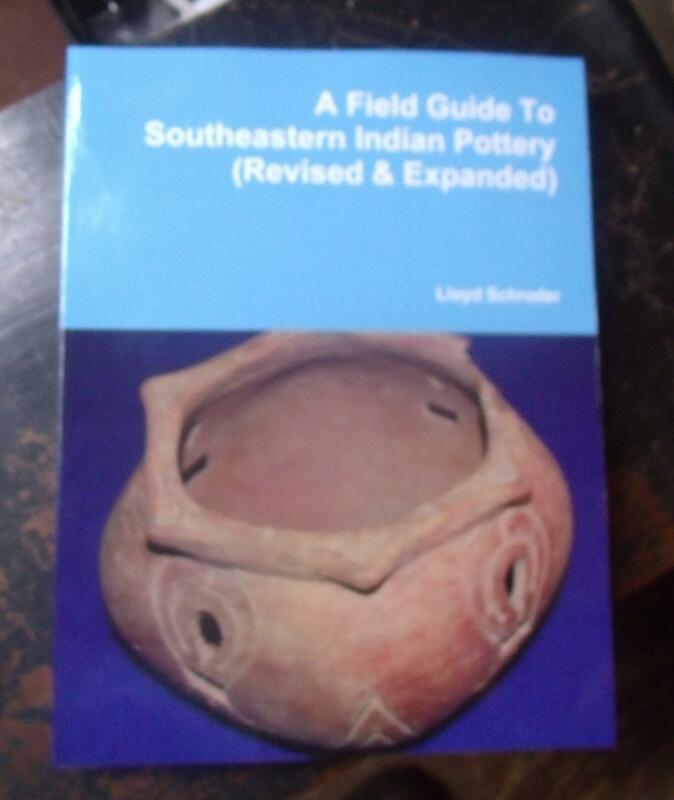 It is thinner and better finished than other plain pottery found at the site. 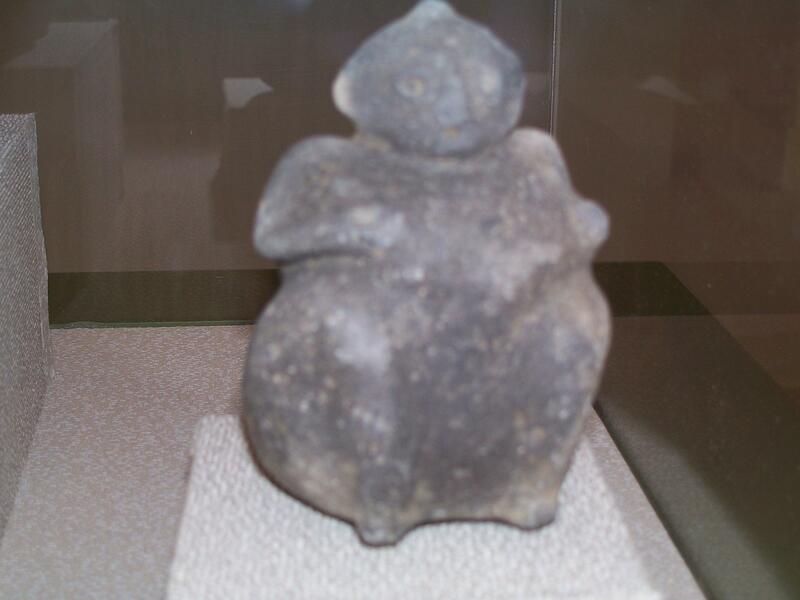 Effigies were usually attached to this type or they were free-form effigies, both animal and human. The vessel surface is frequently well burnished. VESSEL FORM: The vessel form is most often free standing effigies as hooded water bottles or bowls with attached effigy forms, both human and animal. Known forms also include flattened globular bowls. The rims are straight and the lips are narrowed and rounded. CHRONOLOGY: Halstead Plain pottery dates to the Macon Plateau phase of the Early Mississippian period. Associated point types include Mississippian Triangular and Guntersville points. GEOGRAPHIC DISTRIBUTION: This pottery occurs only at Macon Plateau sites in an area no more than 10 miles in diameter around Ocmulgee National Monument. RESEARCH: Thomas M.N. Lewis and Madeline Kneberg named this type in 1970. Lewis and Kneberg did their research of this type at the Hiwassee Island site in the Hiwassee River in eastern Tennessee. The type is named for Hamilton County, Tennessee. TEMPER: Limestone was used as temper in this type. The paste surface color ranges from dark to light gray. Surfaces were smoothed in 30 percent of the examples encountered by Lewis and Kneberg, but scraping marks were often present on the surface. SURFACE DECORATION: This is plain pottery that is occasionally punctated or rarely incised. VESSEL FORMS: Lewis and Kneberg combined Woodland vessel forms into three categories, kettles, jars and bowls. Bowls had rounded bottoms while jars and kettles tended to be semi-conical forms with rounded lips. Some vessels had podal supports. CHRONOLOGY: Hamilton Cord marked pottery dominated the earlier Woodland sites while the plain type was more predominant during the Late Woodland period. This type can be found with Ebenezer, Swan Lake and Camp Creek points. This type can be found with Ebenezer, Swan Lake and Camp Creek points. 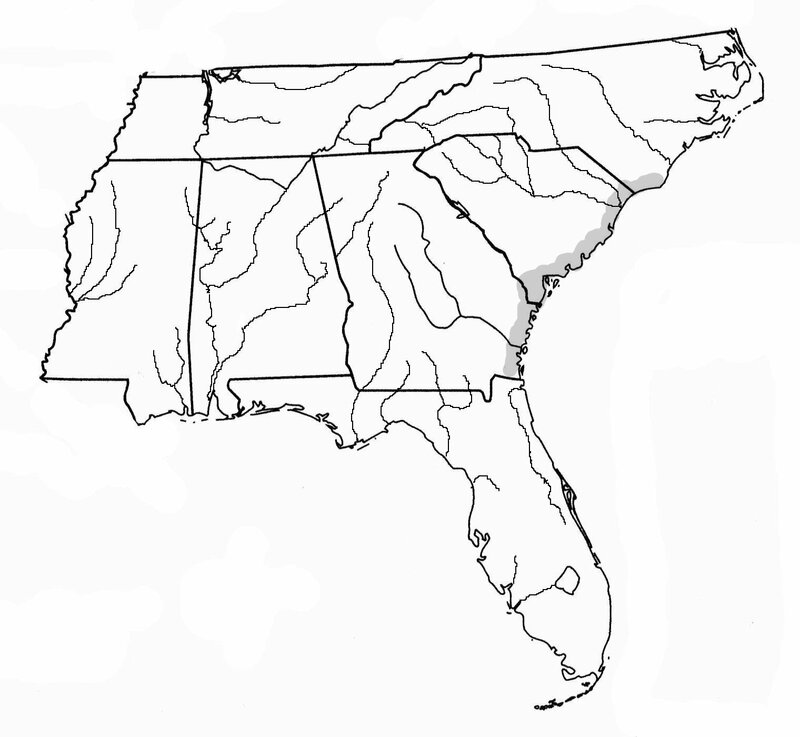 GEOGRAPHIC DISTRIBUTION: Distribution of this type covers all of eastern Tennessee, northwestern Georgia and northeastern Alabama. RESEARCH: This type was named by Frank & Gail Schnell and Jim Knight from their work at the Cemochechobee site in Clay County on the lower Chattahoochee River in 1981. TEMPER: This type is grit-tempered. SURFACE DECORATION: The surface is plain and void of decoration. The rim is often notched along its outside edge. 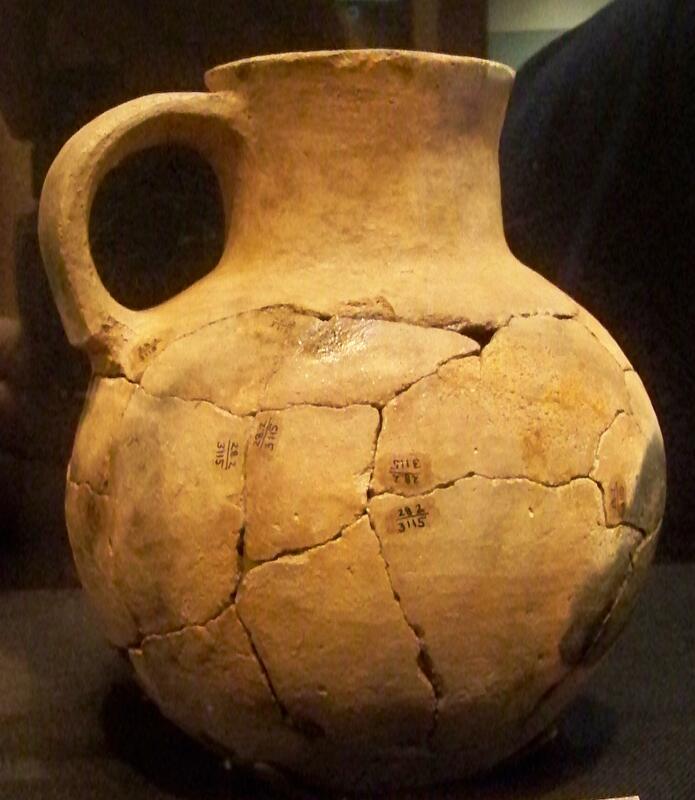 Small jars with straight collars may have multiple incised lines running parallel to the rim around the collar. 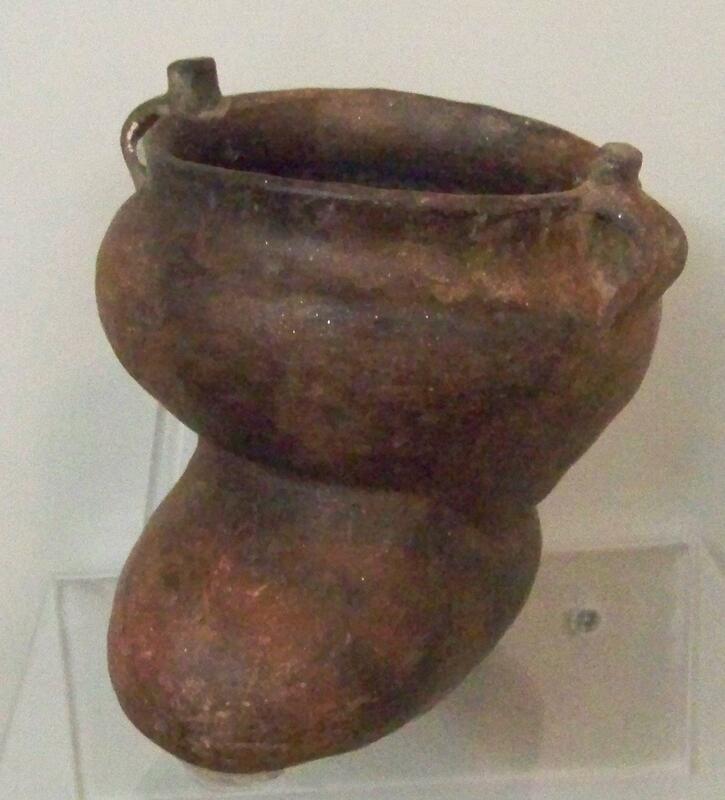 VESSEL FORMS: Simple bowls and deep, globular bowls with out-slanting rims are the dominate vessel forms for this type, although small, globular jars with tall straight collars are known. Both shallow and deep bowls may have spouts affixed along the rim. CHRONOLOGY: Ingram pottery belongs to the Middle to Late Mississippian period and may be ancestral to Lamar Plain pottery in the lower Chattahoochee Valley. Associated point types might include Mississippian Triangular and Guntersville points. GEOGRAPHIC DISTRIBUTION: This type is known to exist along the lower Chattahoochee River valley. RESEARCH: Chester DePratter named this type for the Irene site in Chatham County, Georgia. Excavations had been done at the site in the 1930’s. 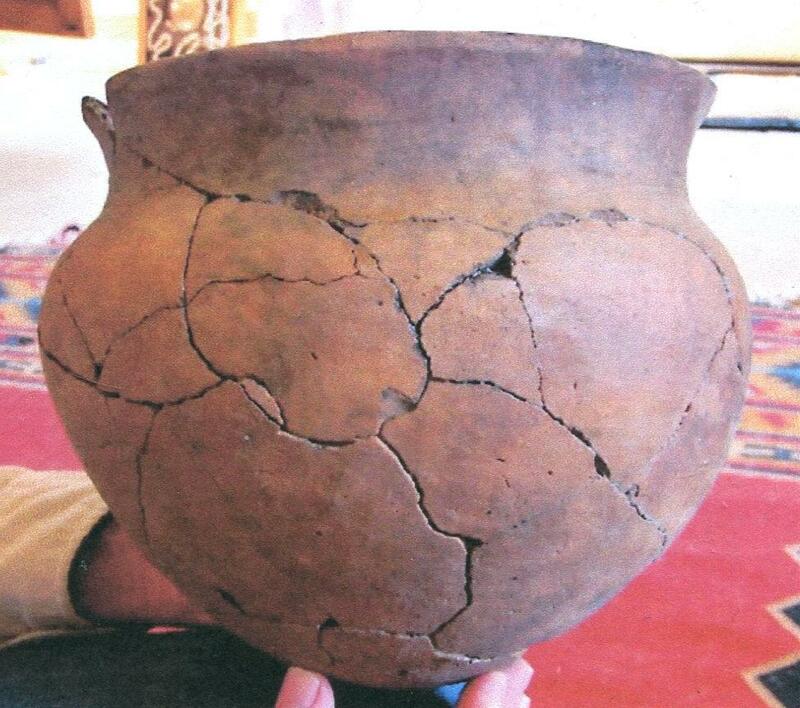 While the Irene name remains in use, most archaeologists believe that Irene pottery and Lamar pottery are the same. TEMPER: Like Lamar pottery, Irene pottery is tempered with coarse grit. SURFACE DECORATION: The surface of the vessel is plain and is finely burnished. VESSEL FORM: Vessels have a wide variety of forms, including bowls with incurving or straight rims, flared rim jars, and specialty forms such as boat-shaped vessels. CHRONOLOGY: This type belongs to the Late Mississippian, Irene period. Associated point types might include the Mississippian Triangular and Guntersville point types. GEOGRAPHIC DISTRIBUTION: The Irene name is applied to this pottery along the Georgia and South Carolina coast. Further inland the Lamar name is applied to this same ware. RESEARCH: Chester DePratter named this type after the Irene site, 9Ch1, located in the northern portion of Savannah, Georgia that was excavated in the late 1930s. SURFACE DECORATION: The surface of the pottery was left plain with the identifying rim formations used as decoration. VESSEL FORM: Known vessel forms include wide-mouthed bowls, hemispherical bowls and elongated globular vessels. Rims are incurving, straight, or flared. Lips are rounded or squared. Bases are round or flat. 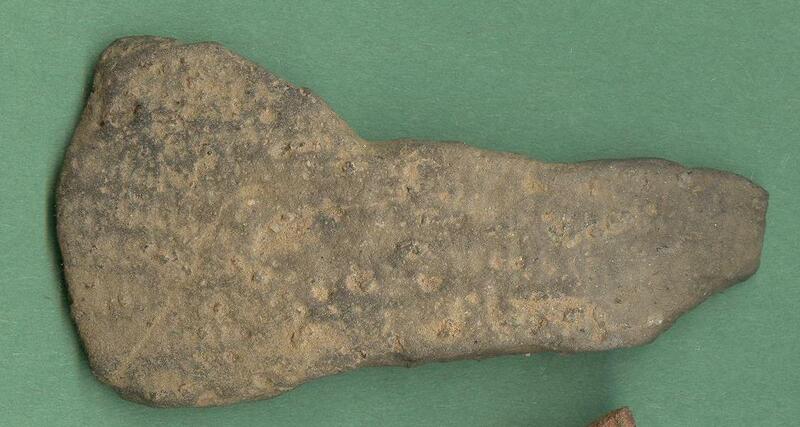 CHRONOLOGY: This is a Lamar/Irene, Late Mississippian period pottery type. Associated point types might include Mississippian Triangular and Guntersville points.